Ian Sheldon is a celebrated artist and illustrator, and has been widely represented in Canada and overseas. Dozens of books feature his lauded illustrations and his fine art has been published in hardcover. While studying for his first degree at Magdalene College, Cambridge, Ian began painting the historic architecture of the city. This lead to representation by the region’s leading commercial gallery, a major exhibit in the city, and an offer from Cambridge University Press to publish his exceptional volume of watercolours Cambridge Footsteps: a passage through time. This collection of paintings is taken from over ten years of work and was launched to celebrate the University’s 800th anniversary. Very much a citizen of the world, Sheldon has lived in South Africa, Singapore and England, and is very widely travelled. He makes his home in Canada where his reputation as a successful Western artist is well established. Sheldon has thoroughly immersed himself in the vast Canadian wilderness and his huge oils that explore his sense of place are highly sought after. With television profiles, magazine cover stories and a considerable archive of other media coverage, Ian Sheldon is rapidly on his way to becoming a household name. Already listed in the Canadian Who’s Who since 2004, further recognition of his contributions and achievements include the publication in 2010 of Creative Glass, a coffee table production of 110 international glass artists. This book showcases Sheldon’s more recent exploration of glass as a medium to portray the landscapes he loves. 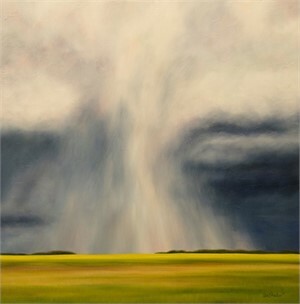 Coming in 2011 is Storm Chaser, a celebration of Sheldon’s iconic stormy paintings, a publication that is sure to cement Sheldon’s presence in the national and international art scene in perpetuity. Ian Sheldon is a celebrated artist and illustrator, and has been widely represented in Canada and overseas. Dozens of books feature his lauded illustrations and his fine art has been published in hardcover. While studying for his first degree at Magdalene College, Cambridge, Ian began painting the historic architecture of the city. This lead to representation by the region’s leading commercial gallery, a major exhibit in the city, and an offer from Cambridge University Press to publish his exceptional volume of watercolours Cambridge Footsteps: a passage through time. This collection of paintings is taken from over ten years of work and was launched to celebrate the University’s 800th anniversary. Very much a citizen of the world, Sheldon has lived in South Africa, Singapore and England, and is very widely travelled. He makes his home in Canada where his reputation as a successful Western artist is well established. Sheldon has thoroughly immersed himself in the vast Canadian wilderness and his huge oils that explore his sense of place are highly sought after. With television profiles, magazine cover stories and a considerable archive of other media coverage, Ian Sheldon is rapidly on his way to becoming a household name. 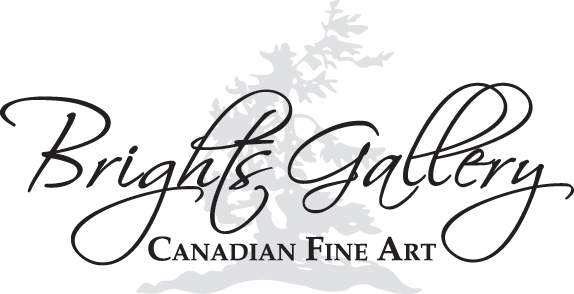 Already listed in the Canadian Who’s Who since 2004, further recognition of his contributions and achievements include the publication in 2010 of Creative Glass, a coffee table production of 110 international glass artists. This book showcases Sheldon’s more recent exploration of glass as a medium to portray the landscapes he loves. 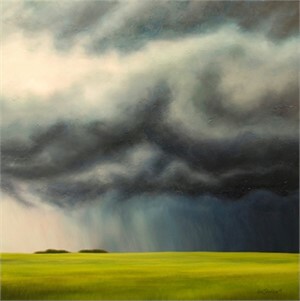 Coming in 2011 is Storm Chaser, a celebration of Sheldon’s iconic stormy paintings, a publication that is sure to cement Sheldon’s presence in the national and international art scene in perpetuity.